Urban Decay is launching a cute, tiny little NEW Troublemaker Palette & Mascara Set on Thursday, 11.16! The palette includes 9 shades in Bailout, Riot, 7&7, Relish, Clash, Knockout, Girl Crush, Bankroll, & Afterhours. 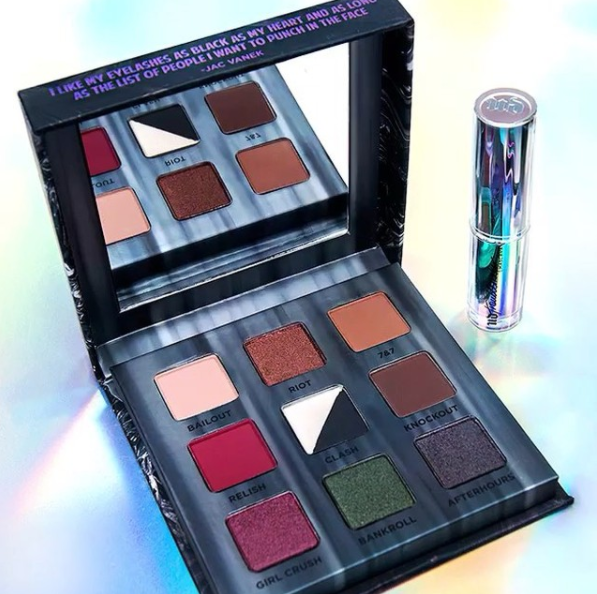 This release has apparently been available at some Macy’s locations so beautifun7 let everyone see some swatches! How sweet is that?! This lucky lady! Ugh! 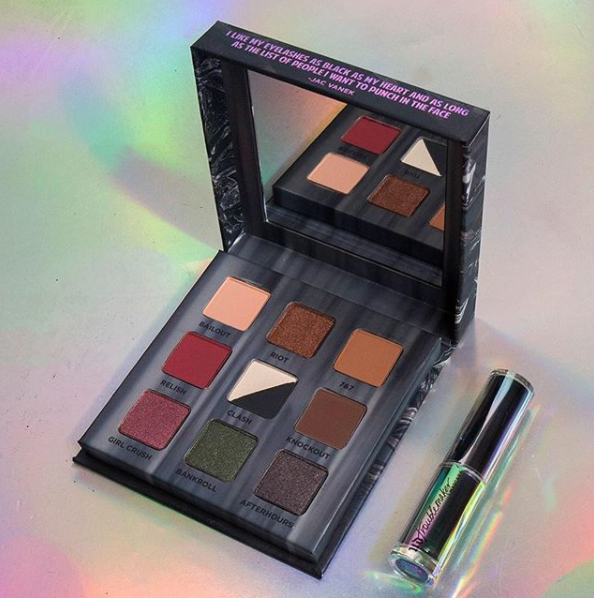 We are into the concept of this palette with the grungy tones and the split pan in the center (that is actually kind of really brilliant because, like we always say, every palette needs a light matte shade and a black so I guess, if you have limited space, just shove both into one pan! The best of both worlds). But overall, we are pretty underwhelmed here. The shades are certainly nothing new to the market and the box-type packaging isn’t really blowing our skirt up, either. 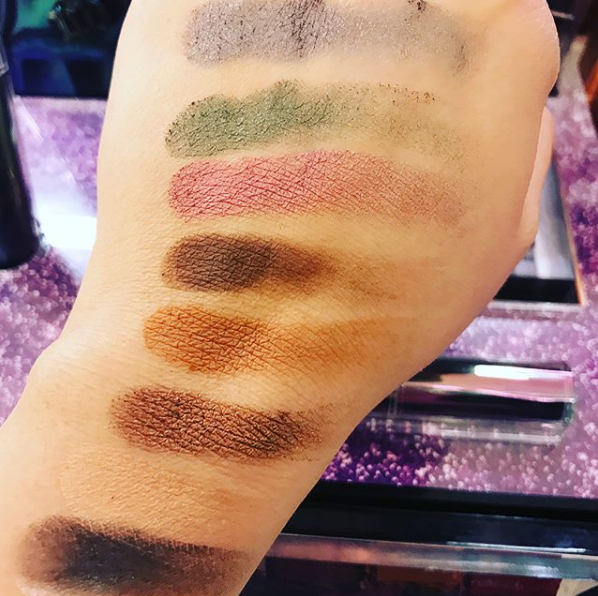 The swatches aren’t even getting us going – obviously we didn’t swatch them so we can’t know exactly how they were done but they look rather patchy and inconsistent and even a bit crumbly… With that in mind, I know I can find every single one of these shades in a palette in my collection somewhere in a formula I know I love. We haven’t heard much in the way of pricing yet so we can’t weigh in on how good of a value this set will be, but we are mostly sure this is going to be a pass. Hi Shannon. Didn’t realise I hadn’t subscribed to your blog posts. Job now jobbed! Ever get the feeling these 9 palette “travel size” offerings are yet another fad? One which was, as is often the case, started by MAC. They’ve had x9 for a good 18 months now. Unless they’re like Juvia’s Place x9 (Zulu, Saharan II), they hold no appeal for me. I think they’re a gimmick and a huge rip-off. Calculate the cost per gram and the answer is a heart attack; not a number! No x9 palettes will find their way into my makeup shelves (apart from JP…obvs!). I don’t care if the packaging is gold plated, they’re a 5-minute wonder, and one day, the Beauty Buying Public will wake up and remove their rose-tinted spectacles. Okay. I’ll climb down from my Soap Box and put it away…till next time.